New Cross Gate was, until fairly recently, known as Hatcham. The village is still remembered in the name of the local schools, the parish, the Liberal Club and Hatcham Park Road. Hatcham is first noted in the Doomsday Book of 1086 where Haecci’s homestead is recorded as having 11 households, some pigs, cattle and crops. The main road from London to Canterbury and Dover, now the A2, played a prominent part in the landscape from Roman times although few Roman remains have been found and in the early days of the 16th century an inn for travellers and pilgrims was existence, close where the A2 splits off to Blackheath and Lewisham, called originally, the Cross, then the Golden Cross and finally, the New Cross. But New Cross was not Hatcham and the manor of Hatcham kept its steady agricultural ways for many years supplying the growing population of London with market produce. 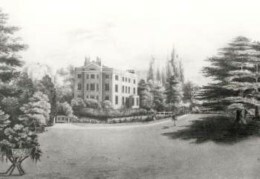 A succession of owners held the manor of Hatcham — including the Crown — in those days. Then, in 1614, it was bought by one of the great Livery Companies of the City of London, the Haberdashers. Originally concerned with the regulation of commercial trade in clothing accessories, the Company increasing became involved with charitable foundations. In buying the Hatcham estate—an immense area of farming land— stretching from North Peckham down to Brockley — it sought to provide income from its William Jones Monmouth charity. Development of the area really first started in 1793 when the Croydon Canal was built. It started at Bermondsey Docks and followed broadly the route of the railway through New Cross Gate and on Croydon. A second branch ran to Peckham. The canal was meant to go through to Portsmouth serving as a Navy supply line but Napoleon was defeated before it could be finished and the route sold to the railways.. The railways came to the area in 1839 and, with their coming, the Haberdashers’ land had huge development potential. By the 1860s majority of the land on the north side of A2 was under development and the large houses, such as Hatcham Park, which previously sat amongst the fields, were demolished. One, Fairlawns, remained until 1904. The site of the house and its gardens which then became the New Cross Tram depot, now the bus depot, and ran as far south as Ommaney Road gives some indication of the size of these properties in comparision to the terraces and semi-detatched house which were replacing them. Telegraph Hill, still market gardens and farms in 1860, remained initially undeveloped as the steepness of the hill made it a less commercial proposition. Pressure on land was high however and the closeness of the City made it too attractive to leave for long. In 1861, the Haberdashers’ Company put forward plans to develop the Hill. The railways come to New Cross Gate in 1839 - a view from the New Cross Road to Brockley and One Tree Hill with Field House on the right. The houses were built to a standardised design, mainly by two local firms of builders and almost all the roads you see now—Pepys, Jerningham, Erlanger, Bousfield, Drakefell and others, conform to that standard. All were built between 1870 and 1899—the majority in the 1880s. The difference between the Haberdashers’ designs and those of other local owners and their builders can easily be seen by comparing, say, Jerningham Road with the adjacent Vesta Road. Indeed, the boundary marker for the counties of Kent and Surrey and that of edge of the Haberdashers’ estate still sit side-by-side where the house design changes in Vesta Road. The houses that were built were still owned by the Haberdashers and to cater for their large numbers of prosperous tenants, two schools, a church and a park were established on the site. The Haberdashers’ Aske’s school was founded in 1875 and overflowed with pupils so quickly that a separate Girls’ school was opened in 1891. Telegraph Hill park and church in 1904. 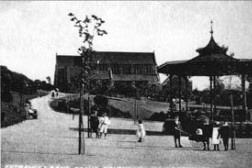 The trees have grown up and the bandstand lost but the Park still attracts many children. The church of St Catherine’s (the patron saint of the Haberdashers) was built on the top of the Hill in 1894. Then, with grants from George Livesay, chairman of the South Metropolitan Gas Company and local benefactor, and the recently established London County Council, Telegraph Hill Park opened in 1895. A London School Board school was established in Waller Road (infants and junior) in 1887 and its sucessor, the LCC, opened a senior school in Walbutton Road in 1927, completing an almost self-contained community. During the 20th century the Haberdashers sold off the estates to private owners. Beyond that, and the increase in traffic, little has changed in this enclave in south-east :London. We no longer have servants, and we probably all have televisions, but the park, church, and most of the schools remain as a testiment to the best of Victorian developments. If you want to know why Telegraph Hill is called Telegraph Hill, follow this link and an explanation of the Gate in New Cross Gate comes here. Or click the navigation buttons below. This page created by The Telegraph Hill Society: the amenity society for residents on the hill. The Society publishes a number of histories of the area. Click here to find out more. © Malcolm Bacchus, Telegraph Hill Society 2004.